In a small bowl, combine wafer crumbs and butter. Set aside 2 Tbsp for garnish; press remaining crumb mixture onto the bottom of a 9 inch spring form pan. Chill for 30 minutes. Spread ice cream over crust; freeze. Meanwhile, in a small bowl, combine the marshmallow crème and milk; stir until well blended. Add extract and food coloring if desired. Fold in whipped topping. Spoon over ice cream and sprinkle with reserved crumbs. Freeze until firm. 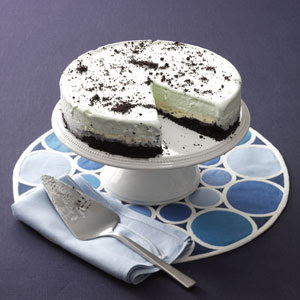 Makeover Frozen Grasshopper Torte takes a classic refreshing combo of mint and chocolate and slashes almost half the calories and two-thirds the fat, but still tastes as good as the original.